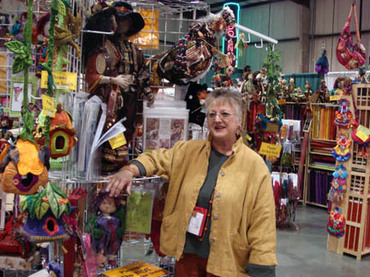 Meet Pamela Armas, the traveling gypsy and her Treasures of the Gypsy booth. This woman is amazing! She supports a group of artisans in India by commissioning the most gorgeous fabrics to be made then sells them around the country at various shows and festivals. She usually doesn't allow photographs to be taken in her booth, but she kindly allowed me to take this one so that I can share with you. And let me tell you that this picture just doesn't do her or her booth justice. If color is your game then she's the one to supply your every need. There's silks, georgettes, crinkled silks, rich brocades, and rich ribbons galore. She also sells many doll patterns and has a display of those patterns sewn using her luscious fabrics. You could spend hours trying to pour over every nook and cranny. Unfortunately she doesn't have a website, but you can contact her via her email here. She has a monthly trim and/or fabric club where you pay a set fee and receive goodie bags. My favorite way is to shop at her booth whenever she comes to town. If you're in the Northern California area at all, the show is going on today and tomorrow at the San Mateo fairgrounds. Here's a link with more information.